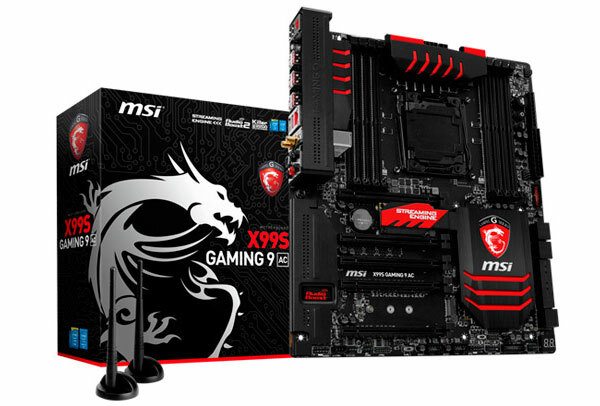 MSI has just announced a new Intel X99 chipset based motherboard aimed at gamers. The X99S GAMING 9 AC motherboard is said to feature the "world's best onboard Streaming Engine". This interesting differentiating feature is courtesy of a "premium dedicated onboard hardware streaming solution," employing a custom AVerMedia encoding chip which enables ultra-smooth Full HD video quality at 60Mbps. Let's start by looking at all the other features of the X99S GAMING 9 AC motherboard before zooming in on the dedicated streaming hardware. This motherboard melds the Intel X99 chipset with many of the MSI GAMING features you will already be familiar with. It supports Intel's newest 8-core CPUs and the new DDR4 memory which can be installed in quad-channel kits. The MSI X99S GAMING 9 AC motherboard also comes with MSI's premium staple GAMING features such as the OC Engine, Audio Boost 2 (powered by Creative Sound Blaster Cinema 2), USB Audio Power, Killer LAN, Turbo M.2 32Gb/s, SATA Express, Intel Wi-Fi AC, Bluetooth 4.0 and 4-way Multi-GPU support. Wrapping the whole lot up is the MSI Dragon Armour and distinctive black and red colour scheme. MSI's Streaming Engine is claimed to be both the world's first and also the world's best onboard hardware streaming solution. So being the best could be down to having zero competition, as admitted by its own PR blurb. MSI says that with Intel Quick Sync not supported on the X99 platform it has stepped in to provide a superior solution in collaboration with AVerMedia. This dediced hardware video streaming solution is called the Streaming Engine. We are told that gamers can "stream at amazing 1080p 60 Mbps quality using HD H.264 hardware compression". The output is optimised for XSplit Gamecaster. Thanks to the AVerMedia chips taking over the encoding work you should not suffer any FPS performance degradation in your games while either recording or streaming. With the growing popularity of eSports streaming MSI might have designed a motherboard with a particularly appealing selling point to PC gamers. We expect quite a flood of new X99 motherboards over the next few hours and days, it will be interesting to see what other manufacturers have done to make their boards stand out from the crowd. Don't AMD and Nvidia cards have solutions to do this on your GPU with minimum impact to FPS? OBS can utilize NVENC on Nvidia cards, but the quality is carp. Not sure about AMD cards. yes they do but they use GPU for capturing and encoding which affects FPS by 5%-10%, this one doesnt have any impact on FPS as capturing and encoding is done through a separate chip (Avermedia) , so its like you have a separate recording hardware which should have zero impact on FPS. All the big motherboard vendors are flipping various switches right now to admit X99 exists, and it's a big ****in' mess. Gigabyte are mostly there, with 7 products announced & detailed in full on their website - but some product descriptions are identical across multiple boards (e.g. Gaming G1 Wifi and Gaming 7 Wifi are identical).